The Buddha was born into a family of the kshatriya varna in Lumbini,Nepal in 567 BCE. He was called Siddhartha Tharu in his childhood. His father was king Suddhodana, leader of the Shakya clan in what was the growing state of Kosala, and his mother was queen Maya Devi. He was raised by his mother's younger sister, Maha Pajapati, after his mother died just seven days after childbirth. He later married Yashodhar, and together they had one child, a son, Rāhul. Both Yaśodhar and Rāhul later became disciples of Buddha. Much of the information on Suddhodana comes from Buddhist legend and scripture. He is believed to be a leader of the Shakya clan, who lived within the state of Kosala, on the northern border of Ancient India. Although in Buddhist literature he is said to be a hereditary monarch, he is now believed to have been an elected head of a tribal confederacy. Suddhodana's father was Sinahana. Suddhodana was said to be greatly troubled by the departure of his son and is reported in Buddhist scriptures to have sent 10,000 messengers to plead with Gautama to return. After the Buddha preached the dharma to the messengers, they were all ordained into the sangha. Later a friend of Suddhodana named Kaludayi invited the Buddha to return, at the request of Suddhodana. The Buddha also preached the dharma to him and Kaludayi was later ordained as a monk. After this request from his father Gautama returned to his father's kingdom where he preached dharma to him. Gautama later returned again to his father's kingdom to see his father's death. Suddhodana became an arahant. Maya was the mother of the Buddha and was from the Koliyan clan. Maya was born in Devadaha, in ancient Nepal. She was married to her cousin King Suddhodana, who ruled in the kingdom of Kapilavastu. In Buddhist texts, a white elephant was said to have entered her side during a dream. When she awoke she found that she was pregnant. As it was traditional to give birth in the homeland of the father, Queen Maya journeyed to Devadaha. However she was forced to give birth en route, in the Lumbini grove. It is said that the Devas presided over the birth and that two streams, one cool and one hot, flowed down from the heavens. Maya died seven days after the birth of her son, whom she had named Siddhartha or "he who achieves his aim." She is said, in Buddhist scriptures, to have been reborn in Tusita, where her son later visited her, paid respects and taught the dharma to her. Ananda was the youngest first cousin of the Buddha. He joined the sangha as a child. He was ordained along with Aniruddha and Bhadra. His father was the brother of King Suddhodana. Ananda later became the attendant of Buddha, almost twenty years after the Buddha's enlightenment, when the Buddha was around 55. The Buddha had many private discourses with, including one on the nature of bhikkhunis. Ananda also helped to found the order of nuns or bhikkhunis. He pleaded with the Buddha to allow women to enter the sangha. The Buddha finally agreed to allow women to be ordained, after many refusals on condition they obey 8 rules governing respect for the monks (garudhamma). Ananda was also present at the death of the Buddha. The Buddha is reputed to have told Ananda, that he could live for the remainder of the aeon and that Ananda could ask for this. However Ananda did not understand the Buddha's words and did not ask. The Buddha was then visited by Mara, who tried to persuade the Buddha to pass away. But the Buddha told him that the time was already right, as he had accomplished his task: to establish the fourfold community of bhikkhus, bhikkhunis, laymen, and laywomen. At the house of Cunda the Buddha asked for food to be served. Hard and soft food was served to the Buddha's disciples but the Buddha was served some poisoned food. He later died after many days of pain and sickness. However, The Buddha instructed Ananda to convince Cunda that the meal eaten at his place had nothing to do with his passing and that his meal would be a source of the greatest merit as it provided the last meal for a Buddha. 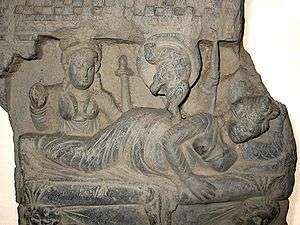 Buddha recovered from his illness before he attained parinirvana. After the Buddha's death, at the 1st council convened by Mahakashyapa at Rajarha, Ananda was asked to recite all of the suttas he could remember. It is from this that he popularly is known as "Pre-eminent in remembering." Ananda gave the responsibility of transmitting teaching to Sanakavasa. Sanakavasa had been trained by Ananda. Ananda then decided to row into the middle of the river Ganges to attain nirvana as the countries of Magadha and Vaisali, who occupied the banks were at war. Both countries called at Ananda to come to their bank but Ananda refused. After Ananda's death Vaisali and Magadha ceased their war. Devadatta was the maternal first cousin (or in some accounts paternal first cousin) of the Buddha. He was ordained into the sangha along with his brothers and friends and their barber, Upāli, when the Buddha preached to the Shakyas in Kapilavastu. For a time, Devadatta was highly respected among the sangha. Shariputra is said to have sung the praises of Devadatta in Rajagaha. After some time, Devadatta developed siddhis and his intention is said to have been corrupted. After gaining these siddhis, Devadatta attempted to kill the Buddha on several occasions, commonly thought to be motivated by jealousy of the Buddha's power. He is reported to have rolled a boulder toward the Buddha, piercing his flesh, and to have incited an elephant to charge at the Buddha. 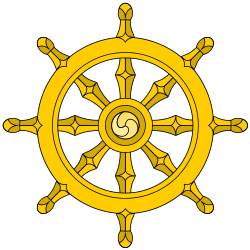 Devadatta then attempted to split the sangha into two, with one faction led by himself and the other by the Buddha. However, this attempt failed as all of his converts returned to the Buddha's sangha. Nanda was a half-brother of the Buddha; the son of King Suddhodana and Maha Prajapati Gautami. Nanda was to be married to a princess named Janapadakalyani but abandoned her to join the sangha. Nanda persevered and became an arhat. Maha Pajapati Gotami (Sanskrit: Maha Prajapati Gautami) was the youngest daughter of King Suppabuddha and Queen Amita. She was married to King Suddhodana with her elder sister Mahamaya (or Mayadevi). When her sister died after the birth of Siddartha Gautama she took Siddartha into her care. She also gave birth to a son, Nanda, to King Suddodhana. Bhikkhus may criticize bhikkhunis (regarding disciplinary matters), but bhikkhunis may not criticize bhikkhus. Maha Pajapati is said to have given the Buddha a robe made of fine cloth. The Buddha refused it, saying it was too elaborate and would cause the sangha to degenerate. Later Maha Pajapati became an arahant. ↑ "The Life of Buddha: Part One: 1. King Suddhodana And Queen Maya". Sacred-texts.com. Retrieved 2012-05-26. ↑ Andrew Mossberg. "Who were the Buddhas?". amidabuddha.org. Retrieved 2012-05-26. ↑ "Devadatta". Palikanon.com. Retrieved 2012-05-26.